We gave our eight favorite celebrities eight wonderful balloons to let them know they’re appreciated for all the entertaining acting and singing they do for us. Here they all are enjoying their nice balloons! Elisabeth was getting her mail when we gave her her balloon, and her face lit up like you wouldn’t believe. 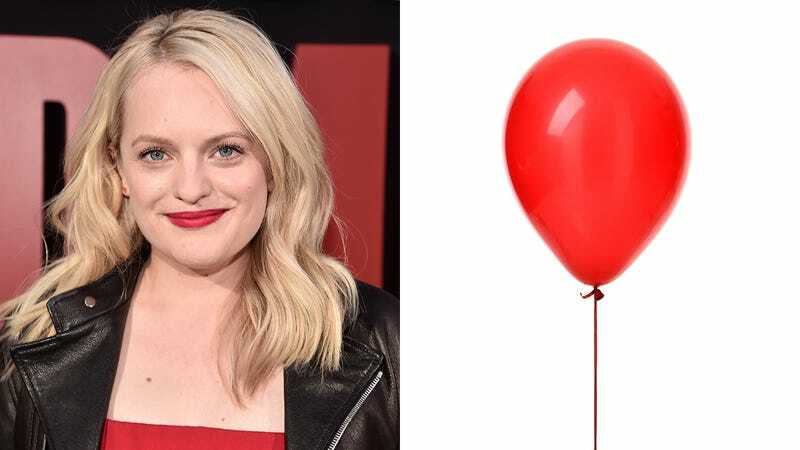 Her balloon is red, the same color as the cloak she wears on her TV show, so she loves it. She even tied her balloon around her wrist so it won’t float away. Smart move, Elizabeth! Hunky Kit loves his cool K-shaped balloon so much that when we gave it to him he jumped in the air, kicked his heels together, and shouted, “Hot apple cider! I got myself a balloon!” Whoa, calm down there, Kit, you don’t want to sprain an ankle and become unable to act! Chadwick’s balloon floated away as we handed it to him, but luckily the major movie star was able to climb atop a stepladder to retrieve it from his dining room ceiling! “Thank God for step ladders!” Chadwick cheered as he applauded himself for getting his balloon down from his nine-foot-tall ceiling. Chadwick loves Halloween, so he’s hoping his balloon doesn’t deflate too much before next Halloween so he can use it to decorate his porch. He plans to keep it in storage until then. We offered Jacob a choice between a swan balloon and a poodle balloon. He asked if those were his only choices; we said, “Yes,” and then he said, “Swan.” Then he gave us a big Tremblay smile. We took Kit’s balloon away. Long story. Alicia Keys got two balloons! Yaaaaas queen! We did not have enough balloons to give Sufjan so we gave him $6 and he LOVED it! We gave George H.W. Bush a balloon for his service to our country. George W. Bush snatched the balloon away from his father and it made him giggle like crazy! A square balloon?! Now J. Lo has seen everything! Looks like she’ll enjoy playing with her unusual new balloon well into the night.